Clarets boss Sean Dyche isn’t concerned by the club’s lack of transfer activity with less than three weeks before the window shuts. Burnley are yet to make a signing in the close season, with their first competitive game coming on Thursday in the Europa League at Aberdeen. The club have had a combined offer of £25m turned down for West Brom pair Jay Rodriguez and Craig Dawson, while they have had informal talks with Swansea regarding Sam Clucas and Alfie Mawson. Dyche accepts he has to be patient, and hopefully things will come to a head before the August 9 deadline. He said: “There’s things progressing. It’s Burnley, it’s not Liverpool, £66million on Alisson. “Those deals get done. It was ‘Alisson might sign for Liverpool’, and it felt like an hour later and he had signed for Liverpool. “That is what we do, it’s difficult. We’re honest and we get questioned, you don’t be honest and you get questioned, you can’t win. “The fact is it’s really difficult because the club is run in a certain manner. We’ve managed to make it make sense, but it’s not easy to make it make sense. “It’s about getting the right players at the right price and making sure they fit the trading model. “There’s a lot of parameters that have to make a signing and it’s really difficult. “I’m not concerned. It’s just the reality. “If we don’t get them in we’ve still got to play, if we do get them in hopefully they will do well. It is an unusual window in that the Premier League deadline has come forward from the end of August, while it is less than a week since the World Cup came to an end. 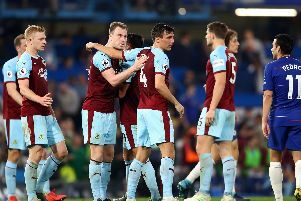 Asked about the impact of both factors, Dyche said: “I’m not sure. Most seasons not much gets done until these stages and the window has made it more condensed and more active. “They’ll probably continue to revisit the window I think over time. “Everybody knows it’s coming so clubs are holding and holding.